Captain Paton was born at Meadowhead in Fenwick parish. He served in the army on the continent,and on his return fought with the Covenanters at the Pentland Rising, Battle of Drumclog and Battle of Bothwell Bridge. Paton was making his way to Fenwick when he was apprehended near to Floak farm (on Fenwick Moor). Captain Paton was executed in Edinburgh's Grassmarket on 9 May 1684. 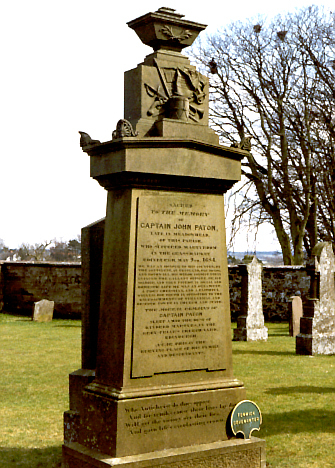 The memorial to Captain John Paton is located on the east side of the church. I N T H E G R A S S M A R K E T .
E D I N B U R G H . M A Y 9TH, 1 6 8 4. DESPOTIC POWER IN CHURCH AND STATE. G R E Y - F R I A R S C H U R C H - Y A R D.
E D I N B U R G H.
A N D D E S C E N D A N T S.
And gain life's everlasting crown.